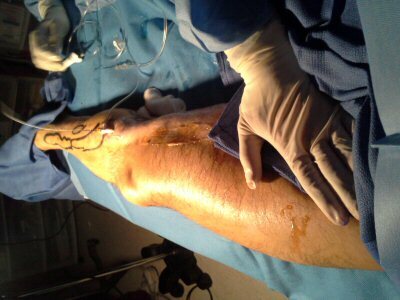 Here is a first hand account of RF ablation of the great saphenous vein, by the Unknown Editor himself. Warning: Graphic content ahead - NOT for the squeamish. 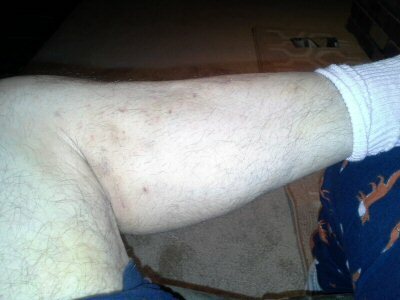 For a while I have had varicose veins in my left leg. For the past year I have been planning to have these veins join my appendix and gall bladder in a out-of-body experience. The veins that show are basically ladder rungs between the great saphenous and other paths, clearly they have given up their original purpose. I followed doctors' advice for wearing support hose (old man socks?) which caused a serious problem: if you allow them to bunch up they constrict veins, and in my case this caused a painful clot. Yes, those sheets are part of my "lair". When you've reached this point, it is time to visit an endovascular specialist and get a team of players onto your payroll. Then you must complete the most important step. 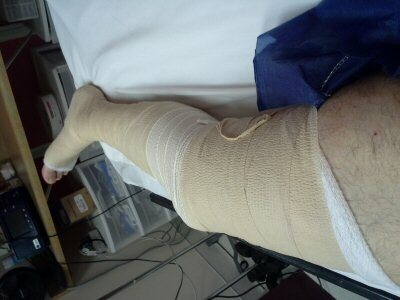 You need to get your insurance plan to agree to cover the procedure. At first they will deny coverage, calling it cosmetic surgery. Eventually they will have to agree to pay, especially if you have a blood clot. 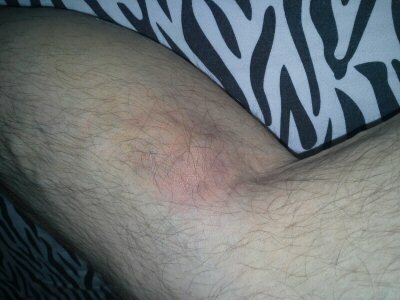 Call it by its proper name, superficial thromboplebitis. 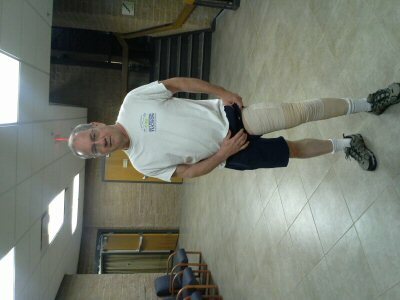 I now have at least one thing in common with Richard Nixon, his phlebitis made the newspapers. Clots are found using sonic scan equipment. 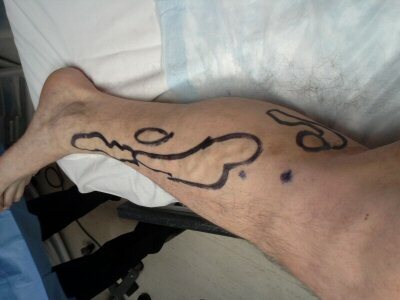 It takes about 20 minutes to scan up and down a leg and evaluate superficial and deep veins. Yes, you get to keep your underwear on. 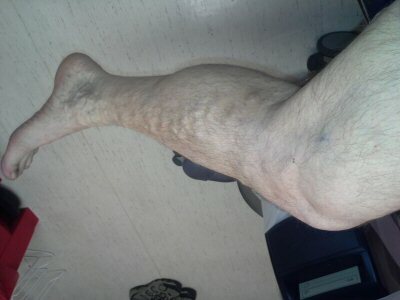 The treatment of leg veins has changed a lot in the past twenty years. 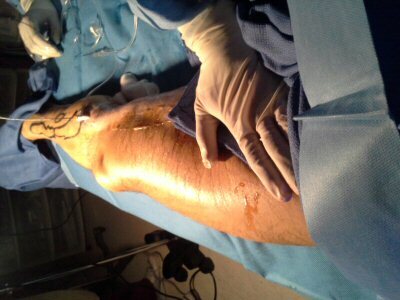 They no longer attempt to pull out long sections of veins, which was painful and led to scarring. The greater saphenous vein is shut down through RF ablation, and allowed to melt its way back into your body, while the ugly little branches are removed through micro-phlebectomy. Here we are on the day of the surgery. You get to take a nice Xanax tablet (two if you ask nicely! ), then walk around for 20 minutes to get the juices flowing. Then its time to drop your drawers and get your leg shaved. 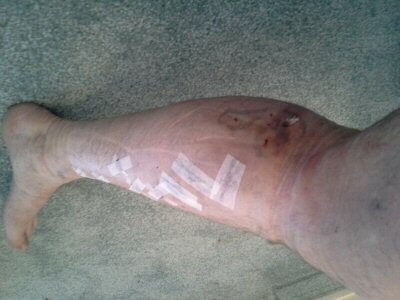 Next step is to agree with the doctor on what veins are coming out, while he/she does a little manscaping to your leg. 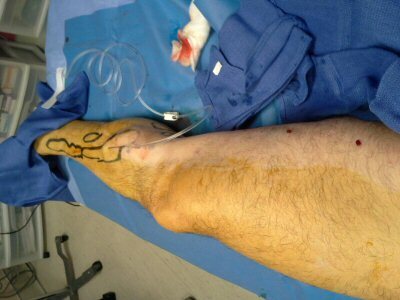 The second picture shows the RF catheter inserted in the vein. Its location is tracked by inch-marks on the cable, as well as sonic scanning. 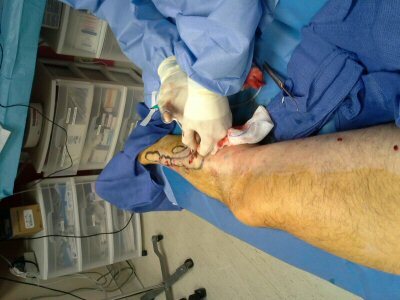 The catheter puts out 20W power (controlled by a foot pedal?) The doc will ask you if you can feel it burn; trust me, you will feel this, kind of like when you are at the dentist and he is drilling and the novocain has not kicked in. If you are in pain he floods the vein with a little more lydocaine. It is easy to see how you can become addicted to anything with "cain" in the name. Here's something Richard Nixon did NOT have in common with me. 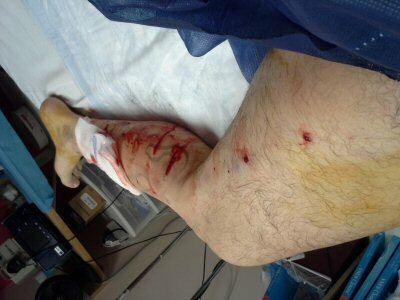 The night before this surgery, that leg carried me two miles in a total of 14 minutes. Bring your running shoes to IMS and you can see how it's doing now. 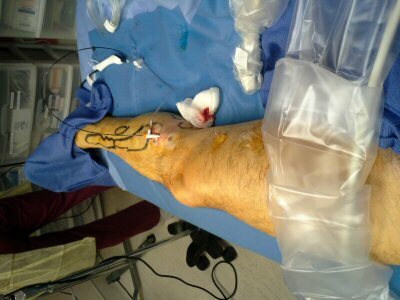 Here is the RF catheter moving down the vein, cooking you from inside out. Thanks for the Xanax! 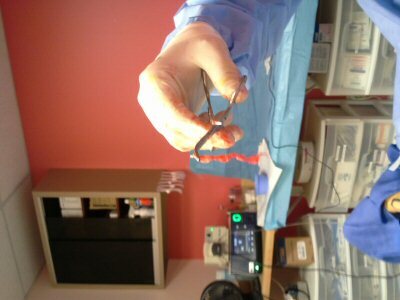 Now comes the bloody part, the phlebectomy. That pink worm was once a healthy vein. The more veins they cut out, the more mess, but you will be enjoying yourself nonetheless. In this clinic, the doctor plays music by request. I chose Chopin but Pandora somehow thought I meant Beethoven. Finally it is time to clean the wounds and tightly bind it all up. Before you go home you need to walk around a bit to make sure nothing is leaking. Yes, those are my PJ's. Foxy! One bit of good news: no traveling for a month. One bit of depressing news: no workouts for a month. It's been a few months, I think the vein has not yet dissolved. If I sit still for three hours (like on a plane) when I get up it feels like there is a rubber band in there that is stretching and thinking about snapping. A strange feeling!